October, where have you gone?! My goodness, it’s been a crazy-awesome month MoFoing with you all. I wish I could have kept up the pace a bit better, but the conference in Houston, Alternative Thanksgiving, and school kept getting in the way. You all were so inspiring and now I’ve got a long list of recipes to catch up on: A-K’s Vegan Haggis, Lazy Smurf’s Sanguine Moon Curry, Monica’s Carrot & Walnut Tofu Neatballs, Chow Vegan’s BBQ Yuba Ribs, Becky’s Lentil & Sweet Potato Soup, and Becka’s Chocolate Breakfast Soft Serve, among others. 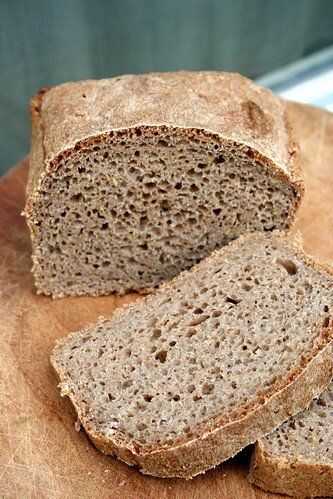 One recipe that I did get around to making this month after it was posted was Mihl’s beautiful Dark Wholemeal Bread with Flax Seeds. The loaf only lasted three days, it was that good, and, remember, there’s only one of me eating my food. Good heavens, the crumb, the dark nutty flavor, the satisfying swipe of each piece against my soup bowl! Mihl’s a goddess of bread baking and her recipe turned out absolutely perfect when I made it. Thanks to her and Peter Reinhart, I will never be able to make a loaf of bread without starting a poolish or biga the night before–the extra fermentation works wonders! The day before mix whole wheat flour and water in a bowl. You can mix it with a spoon just until everything is combined. Cover with a plate or plastic wrap and let rest on the counter for at least 8 hours/overnight. The next day, add remaining flours, salt, remaining yeast, and 10.5 tablespoons of water. In a small bowl mix flax and 3.5 tbsp of water and set aside. Knead the dough for ten minutes. Because the dough consists of whole meal flours only it won’t be as elastic as regular bread dough. This bread has a relatively high water content, so it will also be considerably wetter, a bit like thick cake batter. During the last minute of kneading add the flax mixture. The flax should have absorbed all the water by now. Knead the dough for another minute or until the flax is well incorporated. Preheat your oven to 480°F. Oil a loaf pan or line it with parchment paper and transfer the dough to the pan. Let the dough rise until doubled, or for one hour. Transfer it to your oven and bake for 10 minutes. Reduce heat to 420°F and bake for another 30-40 minutes or until a toothpick inserted comes out clean. A very good way to determine if your loaf is done is a candy thermometer. Stick it into the center of the baked bread and if it registers 93°C/200°F the bread is done. Mihl really is a goddess of bread baking – all the breads she creates & bakes look absolutely wonderful & ever-so tasty ‘n perfect. makes me wish my tummy would agree with the ‘ol gluten. sadface. that’s one good look’n loaf of bread, Jes – it really looks most glorious, i can see why it only lasted ya 3 days. mmmmmmmm! Beautiful bread, Jes. I am going to have to try this recipe. I love the addition of flax seeds. Thanks for the link! And my goodness, that bread looks amazing. I’ve heard of this “poolish” technique but I have never tried it. I think I’ll start with this recipe – that bread looks amazing! And I love the mixture of flours.